No input color profile will be applied. The color matrix will use "1" along the diagonal and "0" everywhere else. Raw files will show the camera's native RGB color. They will only be demosaiced and white-balanced. Non-raw files will be displayed without any embedded input profile applied, including no gamma correction, which means they will look bright. This feature is generally only useful for didactic and scientific purposes. For example if the camera has recorded colors far outside of the conventional gamuts, using no input profile ensures that no color clipping occurs. Looks for and uses a color matrix from the DNG file, from camconst.json, hard-coded in RawTherapee, or from dcraw, whichever one it finds first, in that order. A color matrix is a matrix of 3x3 constant values which is multiplied with the camera's native RGB colors to convert them to colors which are as natural as possible. A color matrix works best (i.e. provides more accurate colors) when the white balance is close to what the matrix was calibrated for. The camera standard matrix is calibrated for D65, i.e. 6500K. Do not worry if the white balance is quite far off from that though, color will be reasonably accurate anyway. For applications where the most accurate and fine-tuned color is not of highest importance, such as landscape photography, the color matrix will provide good colors. An advantage of color matrix processing compared to lookup table-based DCP and ICC conversions is that it's purely linear, i.e. a dark and a bright color of the same hue and saturation is translated the same way. This makes it robust and may be the best choice if you will be exporting images for processing in an HDR application or other application when a predictable linear color response is important. Uses RawTherapee's camera-specific DCP input profile that can provide more accurate colors than the standard matrix (and fall back to legacy ICC profiles if no DCP is available). Available for some cameras, these profiles are stored in the /dcpprofiles directory (or legacy /iccprofiles/input) and are automatically retrieved based on matching the exact make and model of the camera as it appears in the info section in the Editor to the filename, e.g. "Canon EOS 5D Mark III.dcp". if DCP and ICC are not found, revert to the camera standard color matrix. If you want to contribute a camera profile, DCP is the preferred format. Some of RawTherapee's profiles are single-illuminant (Daylight/D50), while others are double-illuminant (Daylight/D50 and Tungsten/StdA). Some include a tone curve, others do not. They strive for accurate colors (i.e. not a specific "look"). Most accurate colors will be achieved for white balances close to the calibration illuminants. Camera profiles work in the normal range, from black up to clipping. If you enable highlight reconstruction, new data is added above the clipping level and if you bring it into visible space (by negative exposure for example), that range will not be naturally covered by the profile. However, RawTherapee will linearly extend the profile to cover this range too, colors there will get the same correction as the brightest colors of the same hue and saturation in the normal range. Specify a custom DNG Profile (DCP) or ICC camera input profile stored on your computer. DCP is a format specially designed for camera profiles and RawTherapee should support the most recent DNG standard (where DCP is defined), so you can for example use all those provided via Adobe's DNG converter. ICC profiles on the other hand are more tricky. ICC profiles can be used for a multitude of purposes (printers, displays etc) and since they're not designed specifically for camera profiling, different vendors have chosen different approaches for their ICC profiles. In practice this means that the input image must be pre-processed in some specific way for the profile to work. The profile itself lacks information of how to do this pre-processing, which means that if you are using a third-party profile RawTherapee may not do the expected pre-processing; results will vary. A DNG Camera Profile, DCP, is the preferred camera profile format for RawTherapee. All elements of the 1.4 DNG specification is supported, with the exception of the black render tag (see below). A DCP can be a pure matrix profile, it can have a LUT (typically 2.5D) to improve the colorimetric accuracy, and then it can have an embedded curve and a separate "look table" on top. It may also add an exposure offset. All those elements can be toggled via checkboxes. However, although it is possible few third-party profiles have been designed to produced the intended color with anything else than all their elements enabled. For example, the tone curve itself changes color appearance so if you disable an embedded tone curve to get a linear profile you can't count on that the color is as intended. The typical third party profile would come from Adobe Camera Raw / Lightroom, and RawTherapee supports them. Many of Adobe's profile lack tone curve, but in Adobe's world that does not mean that no tone curve should be applied but that Adobe's default curve should be applied. RawTherapee will therefore identify Adobe profiles (from the copyright string) and add the default curve to those (which you can toggle with the tone curve checkbox). Adobe's DNG converter may add a "baseline exposure" to the DNG file. Adobe's DCP are designed to work with that baseline exposure and then produce a default output which is about the same brightness and contrast as the camera's own JPEGs. RawTherapee can honor this baseline exposure (NOT YET IMPLEMENTED), but this is of course only available when opening a DNG file converted by Adobe's DNG converter. If you instead open a native raw file there will be no baseline exposure and Adobe's DCP may then make a too bright or dark rendering. You can simply adjust with the exposure slider of course. The DCP format also has a black render tag. This indicates if the raw converter should do "automatic" black subtraction or not. RawTherapee ignores this tag, you can do manual black subtraction with the black slider. As many of Adobe's profiles indicate auto black subtraction and Adobe Camera Raw / Lightroom does it, RawTherapee will in comparison in those cases render a bit lower contrast and brighter shadows. RawTherapee has specific support for ICC profiles bundled with Capture One and Nikon NX2, so those should work well. Older ICC profiles are not likely to work well though (typically the image becomes extremely dark with unsupported ICC profiles). Some ICC profiles apply a tone-curve and desaturate bright highlights for a more "film-like" look. Those profiles may not work well together with Highlight Reconstruction. If you see a radical change in contrast when you apply your ICC profile it has applied a tone-curve and then you should not use it together with Highlight Reconstruction. Unlike DCP profiles, ICC profile processing may cause clipping of extremely saturated colors during conversion. In practice this is rarely if ever a problem, but still DCP should be considered the primary choice if available. Note on using Capture One ICC profiles: RawTherapee applies the ICC before exposure adjustments, as the intention is that camera profiles should only be used to make the camera more accurate, not really to apply a look (you design the look using the tools instead). Phase One's ICC profiles contain a subjective look though, which means that they typically contain "hue twists", for example saturation in the shadows are increased a bit extra. This means that if you have an underexposed file and push it a few stops those hue twists have been applied on the dark image before exposure adjustment and will thus be in the wrong places after pushing, that is you don't get the same look as in Phase One's Capture One. Therefore it's recommended to have the right exposure out of the camera when using Phase One ICC profiles. You should also apply a suitable RGB "film curve" for example by using the curve tool, as those ICC profiles are designed to be used together with that. We are aware that LUT ICCs should typically be applied after exposure (just as DCP Looktables are applied), and that would support for example Capture One profiles better. This may be fixed in a future version. Some of RawTherapee's profiles are single-illuminant (Daylight/D50), while others are double-illuminant (Daylight/D50 and Tungsten/StdA). If a dual-illuminant profile is loaded the "DCP Illuminant" setting will be enabled and you can choose which illuminant to use. The actual DCP standard (part of the DNG standard) does not provide this choice, but instead an interpolation between the two illuminants is calculated based on the chosen white balance (there will only be an interpolation if the white balance is in-between both illuminants, otherwise the closest is picked). This "interpolated" mode is the default setting of "DCP Illuminant" and for any normal use you do not need to change this. You can however choose to base the color rendering on one of the specific illuminants. In some cases this might produce more pleasing color. It can also be interesting for diagnostic purposes to see how large (or small) a difference there is in color rendering between the illuminants, but, as said, for general use this setting should be untouched. Some DCPs contain a tone curve which may be used to add contrast and brightness to provide a film-like look. This is mainly used for profiles simulating camera maker settings. The tone curve checkbox will be disabled for profiles which do not contain a tone curve. 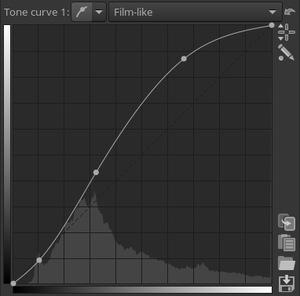 The curve mode used by the DCP tone curve is the same as the Exposure tool's "film-like" mode, meaning you can reproduce the effect using the Exposure tool's tone curves in film-like mode. When contrast is applied with a film-like curve the appearance of the colors will change and overall saturation is increased, except for bright colors which instead are de-saturated. Some profiles which have curves embedded are pre-corrected for this color appearance change and will thus not provide the intended look without the curve applied. Most will however work well without the tone curve applied especially if you add a similar curve yourself using the Exposure tool's curves, but if you want to see exactly how the profile designer intended the colors to look you should enable the tone curve. While the input color profile is applied at the first stages of the toolchain pipeline, the DCP tone curve is applied later in the pipeline at some point after the Exposure tool. This enables the DCP "HueSatMap" lookup table which is used to add non-linear corrections on top of the basic matrix. This is an advanced user setting and unless you want only the pure matrix result should leave it on. It's grayed out if the loaded profile lacks a HueSatMap table. This enables the DCP "LookTable" lookup table which is intended to add a subjective look on top generally together with an embedded tone curve. That is if you disable the DCP curve and looktable you may get a neutral "colorimetric" profile, if the DCP was designed that way which is not always the case (if the DCP has both a look table and a base table it's likely that it is, but if it only has a look table it will probably not work well with it disabled). Disabling individual DCP elements are considered advanced user settings, normally you would leave this on. The DCP may indicate an exposure offset that corresponds to an offset of the exposure slider. The purpose of this is typically to make the brightness of the image match the brightness of the camera's own JPEGs, which can be useful if you're shooting with auto-exposure. Currently this offset is applied "under the surface" so you don't see it on the exposure slider. Note that if you are using Adobe's proprietary profiles those are expecting that the DNG's "baseline exposure" tag is applied too (the profile's offset is added on top). Currently there is no support for the DNG tag so you need to find that out on your own (using exiftool for example) and then set that offset using the exposure slider if you want to get the exact same brightness as in Adobe Camera Raw. Clicking this button saves a linear TIFF image before the input profile is applied. This file can then be used for profiling, i.e. creating a new ICC camera profile. There are various commercial software out there to make ICC profiles, but you can also use the free and open-source Argyll. For DNG profiles there is DCamProf as an open-source alternative. Cropping, resizing and transform (rotate) will be applied so you can use that to make the output more managable by the receiving software. Argyll is very picky for example and want no more than the test target visible in the image. You can also choose if you want to export with white balance applied or not. For ICC profiles you should export with white balance applied, but if you intend to make a DNG Profile ColorMatrix (or a DCRAW style color matrix) you should export without. The default working profile is ProPhoto and should not be changed for normal use. The working profile specifies the working color space, which is the color space used for internal calculations, for instance for calculating saturation, RGB brightness/contrast and tone curve adjustments, chrominance, etc. When RawTherapee was based on integer math it was wise to not use working space larger than absolutely needed to get the best precision in the calculations. However, RawTherapee had switched to floating-point processing in 2011, and since version 4.0.12 the default working profile is ProPhoto, which has a very large gamut. The choice of working profile has an influence on the effect of the curves in all modes except for perceptual - in that mode, changing the working profile will not alter the effect of the curve. If you have trouble fitting colors within the output gamut you can experiment with changing the working profile when using curves in any mode but perceptual. Note that the working profile will only specify the red, green and blue primaries, gamma will not change as RawTherapee's processing pipeline is floating point with no gamma encoding (that is gamma = 1.0). Some tools (like curves and histograms) will still display with a gamma (usually sRGB gamma) which is hard-coded for the tool and stays the same regardless of working profile. If "matrix" is present, "file" is ignored. If only "file" is present, the matrix is extracted from the ICC profile. For this, RawTherapee looks only at the R, G, and B matrix columns and the white point set in the profile. Bradford adaptation is used to convert the matrix to D50. Anything else in the profile (LUT, TRC, etc.) is ignored. It is the user's responsibility to ensure that the profile is suitable to be used as a working space. Specify the output color profile; the saved image will be transformed into this color space and the profile will be embedded in the metadata. The effects the output profile has on the image cannot be seen in the preview. RawTherapee lets you specify "input" (e.g. you're camera's profile), "display" and "output" (i.e. printer) device class profiles with an RGB color space, because RawTherapee saves only RGB images. Profiles listed in this combobox are those which come bundled with RawTherapee and those located in the folder set in Preferences > Color Management. The soft-proofing feature is dedicated to simulating printer rendering. It lets you preview what your image will look like when printed, assuming you use a printer profile which correctly simulates your printer and paper combination. For best printout quality, after you have tweaked your photo using soft-proofing, you should select your printer profile as the output profile and save the image using it. This ensures that the image is encoded using your printer's color space directly from RawTherapee's internal high quality floating-point representation, instead of being saved to an 8-bit image in sRGB for example and then having to be subsequently converted to the printer profile, which would be quite lossy. The main histogram, navigator and clipping indicators will use either the working or the output profile, depending on your setting in Preference > General. The recommended output profile when you're saving to an 8-bit format and/or publishing to the web is RT_sRGB. If no profile is selected, none will be embedded, which means that "sRGB" is implied, though it is safer to embed RT_sRGB in terms of getting your image displayed properly in various applications. RT_sRGB is a higher quality version of the standard sRGB profile, which surprisingly is inconsistent between implementations. RT_sRGB was custom-made for RawTherapee by Jacques Desmis and has 4096 LUT points, as opposed to the lower quality 1024 point sRGB profiles. Applications that aren't color managed and won't take advantage of RT_sRGB will fall back on sRGB. Wide-gamut output profiles such as RT_Large_gsRGB are generally used if you export to a 16-bit or higher bit-depth format for further editing in another application. If you will be sending your image for printing, a wide-gamut output profile is also recommended, since some printers may have wide gamuts (at least in certain colors). You should have a wide-gamut monitor if you want to work with wide-gamut profiles, otherwise you're flying in the dark. This page was last edited on 10 August 2018, at 14:24.